Book Details: Extremely rare Limited Edition #10, this book serves as a historic reference and identification guide for Dance revolvers. Limited Edition #10. 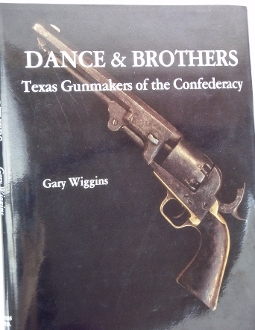 Signed by author Gary Wiggins as well as two Dance descendants Mary Eloise Dance McNeill and Sarah Dance Brown. Rare to have these three signatures. The jacket shows very little wear with some edge curling and a few small tears. The book itself shows little wear and very little handling marks, edge or corner wear on the cover. Extremely nice book & jacket, a must have for the Confederate gun collector especially with the signatures of descendants of the Dance brothers. Book is out of print. Nice black & white illustrations. Measures 8 3/4” x 11 1/4”.